- From your hand between your knuckles and wrist to about 2” (5.1 cm) past your elbow. This will be the length of it (M1). - The circumference of your wrist and subtract 1/2” or 1.3 cm (M2). - The circumference about 2/3 the way between your wrist and elbow, and subtract 2 inches (M3). Using the picture and your measurements sketch your pattern on newspaper. Cut the pattern out and make sure it fits. 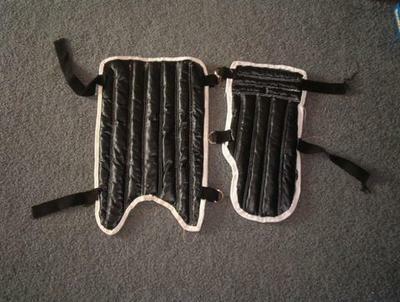 Cut out 2 of these in the leather-like material. Flip the pattern over and cut 2 more out for the other arm. At the wrist part draw a straight line 1 1/4” (3.2 cm) across. Note: If the marker you use doesn't come off, make sure you draw the lines on the side that won't show when you put them on. Draw another 1/4” (0.6 cm) away from the first, then from the second line draw another line 1” (2.5 cm) from that one. Draw another line 1/4” (0.6 cm) from that one. 1” (2.5 cm) from your newest line, draw another, and finally draw one more line 1/4” (0.6 cm) from it. You will have a total of six lines. You now should have 3 bars that are 1” (2.5 cm) wide with 2 lines 1/4” (0.6 cm) between them. Find the center at the wrist and draw 2 lines 3/4” (1.9 cm) long on either side of the center perpendicular to the wrist bars. From those lines draw 1/4” (0.6 cm) on either side and 1 1/2” (3.8 cm) from those draw another. 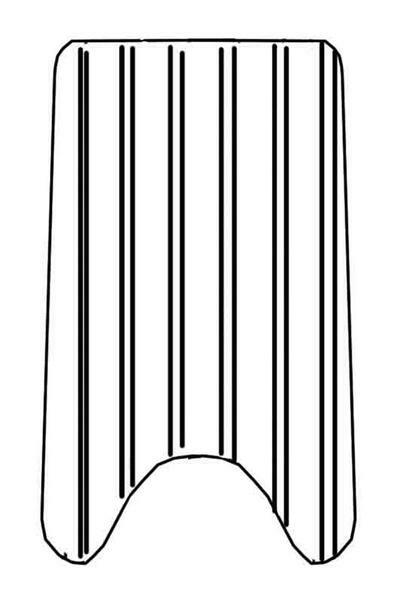 Keep doing this with 1 1/2” (3.8 cm) bars with 1/4” (0.6 cm) separating each line drawn. Take another piece and put it together with wrong sides facing each other. Sew along the lines you've drawn. Repeat these steps for the other arm. 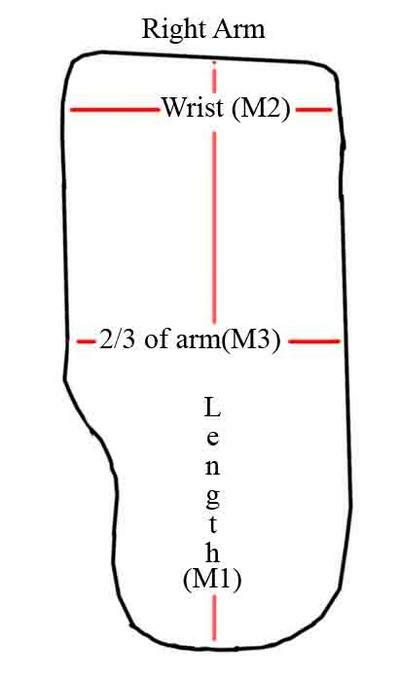 Measure 1” (2.5 cm) below the knee to above the ankle (M4). 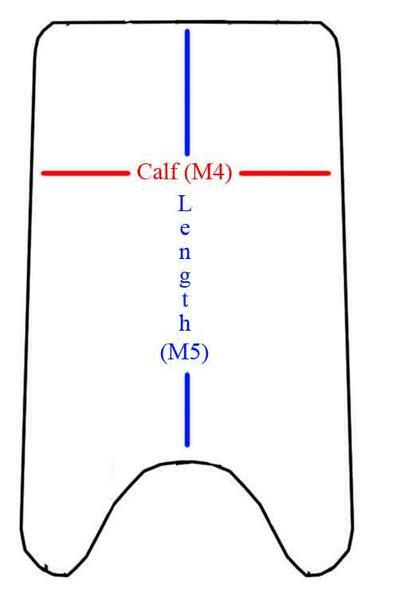 Measure from biggest part of your calf and subtract 4 1/2” or 11.4 cm (M5). Using the picture, sketch it out on newspaper and adjust as needed. Cut 4 of the same piece out. 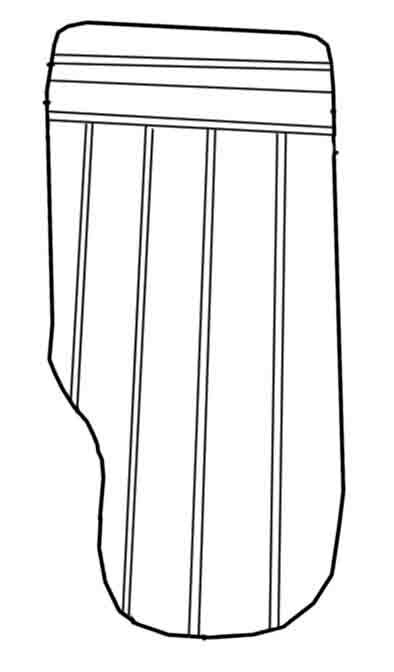 Using the same method as the arm guards, find the center and on each side draw a line 1” (2.5 cm) from that center. Each bar is 2” (5.1 cm) wide separated with 2 lines 1/4” (0.6 cm) apart. Using fabric scraps and a long stick, stuff the fabric into the pouches you made. Don't stuff it too full, but put enough so that it bulges somewhat. Hand sew the edges closed. Cut out strips 1 1/4” (3.2 cm) wide of white fabric. Fold over 1/4” (0.6 cm) on each side and sew. Fold the strips around the edges and sew it on. I hand sewed it because it gives me more control. Take the straps and cut out 8 strips about 3” (7.6 cm) long to hold the D-rings. Sew one end onto a side of the guard, put 2 D-rings in it and sew on the other end. Do that for each piece you cut out (2 on each arm and 2 on each leg). Measure how long you need for the strap to fit around your arm/leg and make sure there is more so you can pull it through the rings. Finally, sew those straps on the opposite side that you sewed the D-rings on. See also Jennifer's patterns for Madam Hooch's Robes and Madam Hooch's Vest to complete this costume. © Jennifer's pattern was taken with permission.